The other weekend, some of my favorite knitting buddies came over for a little yarn dyeing fun. When I was dyeing yarn and selling it on Etsy, I would do it in my basement. 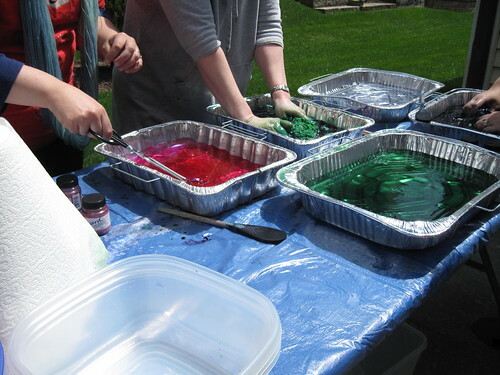 But, this particular Sunday it was so beautiful that we took the yarn dyeing out to our back yard. Yum. Yum and Yum. Everyone took their skeins home and I can't wait to see how they knit up. Lots of semi-solids in there for shawls and Cookie A socks! Beth dyed some roving too (which is on the bottom left of the pic above). I think it's going to spin up awesome! 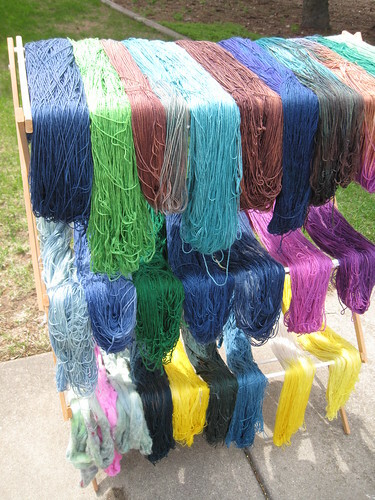 I hope to have another yarn dyeing day with my friends soon. We always have such a fantastic time! Happy knitting (and yarn dyeing)!